Love cold sesame noodles? 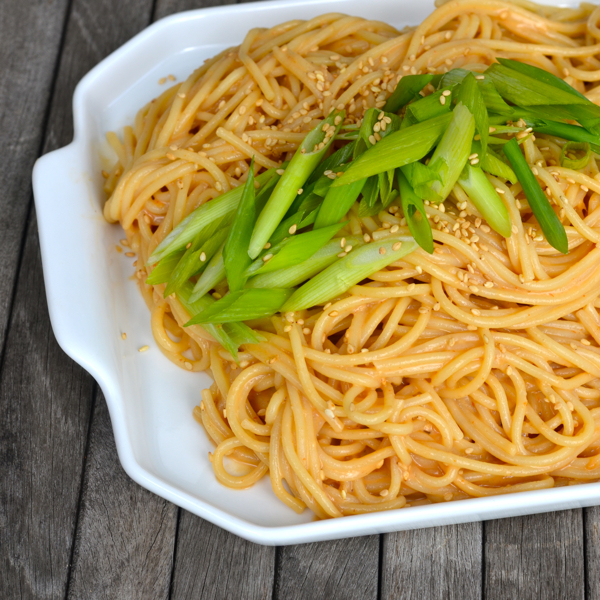 No need to call your favorite chinese restaurant to deliver, you can make your own delicious homemade noodles just as quickly using a few simple ingredients! 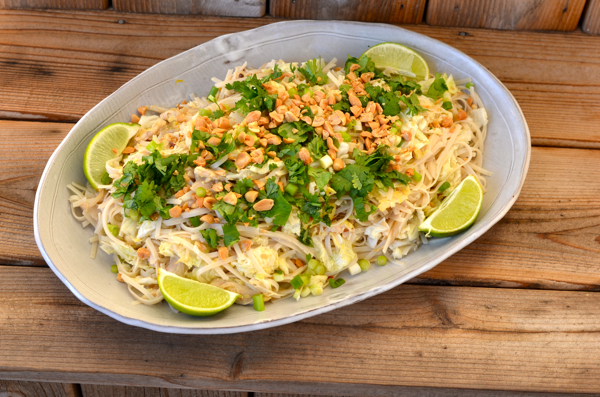 Cold sesame noodles are also a great side dish while grilling your favorite meat , fish or vegetable. 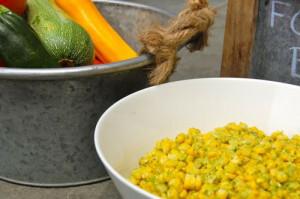 Love another great side dish to entertain with that can be made in advance and set aside until you are ready to serve. 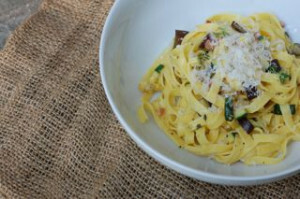 This recipe is from Tyler Florence and my favorite recipe for cold sesame noodles! From by the bay , wishing you cold sesame food memories! Cook the noodles in large pot of boiling unsalted water over medium heat until barely tender and still firm. Drain immediately and rinse with cold water until cold. Drain the noodles really well and transfer to a wide bowl; toss with the sesame oil so they don’t stick together. Chill. In a blender combine the peanut oil, ginger, garlic, chili paste, lime juice, brown sugar, peanut butter, vinegar, soy sauce, and hot water. Blend. Toss the noodles with the peanut sauce until well coated. Serve at room temperature or chilled; garnish with the sesame seeds, green onions, and cilantro. This entry was posted in Pasta, side dish and tagged angel hair pasta, chinese recipes, cold sesame noodles, peanut butter recipes, rice wine vinegar, sesame seeds, Tyler Florence, vegetarian recipes on June 15, 2016 by entertainingbythebay. Here is a classic to enjoy with your next barbecue – Deli style macaroni! Sometimes, you want to keep it simple. I mixed up the recipe with some Mexican cream because I had some in the refrigerator. If you can’t find Mexican cream you could replace the cream with an additional 1/2 cup mayonnaise with a 1/4 cup sour cream. It all works well. From by the bay wishing you happy deli food memories! 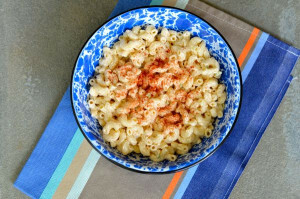 This entry was posted in fun Foods, Pasta, side dish and tagged deli style macaroni salad, macaroni recipes, macaroni salad recipes, mayonnaise recipes, mexican cream, pasta recipes on July 22, 2015 by entertainingbythebay. 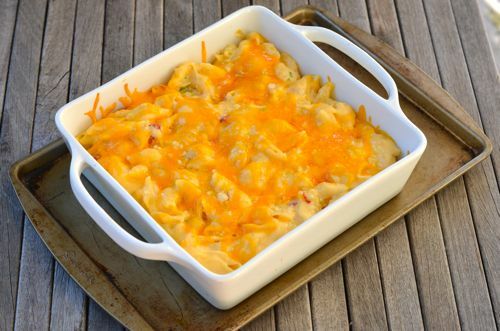 If you are planning a holiday menu this season, try this update to the classic mac and cheese. 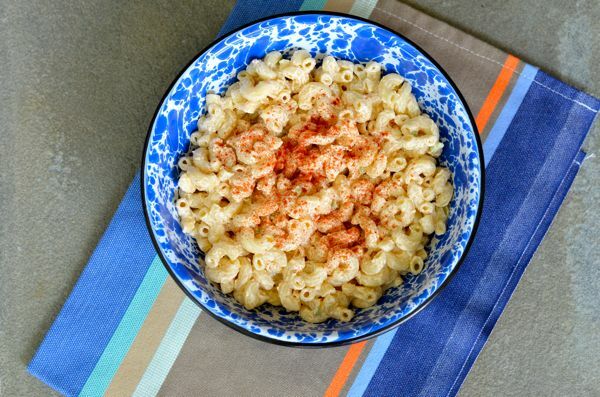 This recipe is inspired by the famous pimento cheese served in the South. In fact , some say pimento cheese is the caviar of the South. The key ingredients include cheddar cheese, pimento, cream cheese and hot sauce. Well that’s just a step away from making a delicious mac and cheese! It’s an easy and delicious side to any holiday meal, but especially thinking about that holiday ham ! From by the bay, wishing you some cheesy holiday memories! In a large pot of salted boiling water cook medium shells according to directions until al dente. Strain and keep aside. In a medium sauce pan warm the milk. In a large pot ( I use the same pot as I did for the pasta) melt butter . Whisk in flour mixing into a paste, keep moving for about 5 minutes. Slowly whisk in the warm milk stirring to make sure there are no lumps. Whisk until the sauce starts to thicken. Remove from heat and add the cream cheese and whisk until melted, then add 1 cup cheddar and 1 cup parmesan cheese. Stir until melted than add the hot sauce, scallions, pepperdew and cooked shells. Mix well and pour into a buttered 2 quart baking dish. Top with remaining cheese and bake in a 350 degree F oven for 20 minutes, until the cheese is melted . Remove from oven and let rest for 5 minutes before serving. This entry was posted in Pasta and tagged cheddar cheese recipes, holiday recipes, hot sauce, mac and cheese recipes, macaroni recipes, party recipes, pimento cheese recipes, pimento mac and cheese, southern cooking, southern recipes on December 11, 2014 by entertainingbythebay. One of my “by the bay” family traditions is the birthday dinner night. I like to come up with a food theme and decor that suits the birthday “girl” or “boy” and run with it! My dining room has been everything from a German beer hall to the top of the Eiffel Tower. For my sister Diane’s birthday last year, I decided to create a Mexican Cantina. Most of the menu was authentic Mexican dishes, but one of Diane’s favorite dishes is Macaroni and Cheese. I went online to see how people have tackled this dish in the past but I was put off by the taco inspiration for most of the recipes. I was about to figure out another dish when I remembered having roasted poblano crema in a Mexican restaurant. I proceeded to create a roasted poblano cream by considering the bechamel sauce as the crema and infusing it with roasted poblano peppers as the base for the macaroni and cheese. The results were great and the cantina and party were a big success ending with an impromptu musical serenade, it doesn’t get better than that! From by the bay wishing you tasty mac and cheese food memories! Fill a large sauce pan with water and bring to a boil to be used to cook pasta. Preheat broiler , place whole poblano peppers on baking sheet about 4 inches below a hot broiler . Roast turning several times the pepper until they are softened and start to blacken in spots, approximately 12 minutes. Remove from oven and cool for 5 minutes in a covered bowl. Take a towel and wipe off the skin from the peppers. Remove the stem and seeds. 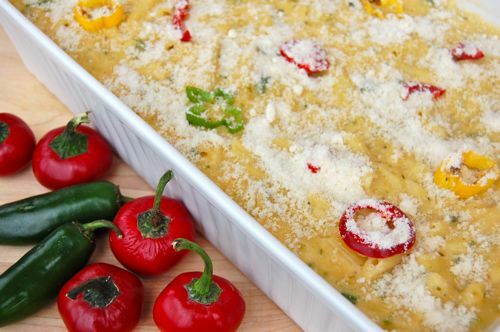 Place peppers into food processor along with the milk and puree. Place milk and pepper mixture into a medium sauce pan and heat until it is about to boil. While the milk is heating, in another sauce pan , heat the butter until melted. Add the flour and mix until smooth. Cook the mixture for about 2-3 minutes until it becomes a golden color. Slowly add the hot milk to the flour mixture whisking continuously. Bring to a boil and then cook for another 10 minutes continuing to whisk until the sauce begins to thicken. When the sauce is ready it should stick to the back of a wooden spoon. Remove from heat and whisk in the salt and nutmeg. Add the grated cheddar and Monterey Jack cheeses to the sauce and stir until the cheese has melted. Place cheese sauce aside. Add penne to the boiling water and cook al dente according to package directions and strain through colander. Rinse with cool water. Add the cooked penne to the cheese sauce along with the scallions and mix well. Turn the pasta into a 3 quart casserole dish. Sprinkle with parmesan cheese and bake in a preheated 350F oven for 45 minutes until the sauce starts to bubble. Remove from oven and cool on a wire rack for 5 minutes and serve. Garnish with cilantro leaves. 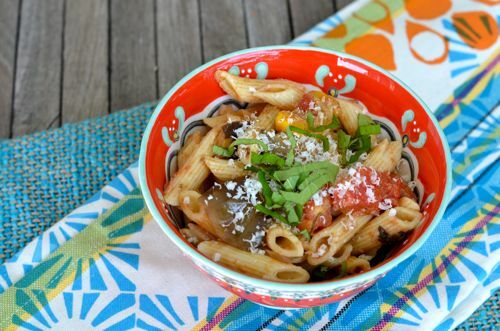 This entry was posted in Pasta and tagged cheese recipes, cilantro recipes, mac and cheese recipes, mexican cooking, mexican recipes, poblano recipes on May 24, 2014 by entertainingbythebay. New York City and it’s outer boroughs are a wonderful place to grow up. This is especially true as a young child discovering New York City. I often think of NY as a collection of neighborhoods strung together, each one unique to discover. It’s amazing how there are all these wonderful locations tucked away ,often, only discovered when someone who inhabits one of these special places, invites you to share in their special world. Rockaway Beach in Queens is such a place. It stretches on a peninsula along the Atlantic Ocean and is the largest urban beach in the United States. The streets are lined with small bungalow houses. Fun fact these bungalow’s are currently being used to film the new HBO show Boardwalk Empire – recreating the rows of bungalows that once existed behind the Atlantic City Boardwalk – another favorite location from my childhood…but that’s another blog entry. This one is about how , as a child , my family would visit one of those cute bungalow’s in Rockaway Beach. The days were filled with sun, sand and clams. We would dig for clams along the beach and then the clams would be cleaned and cooked. It seemed to me that there were endless buckets of clams to eat, the adults would sit drink and laugh and the kids would be running along the beach. It’s here that I ate my first of many clams right out of the shell. 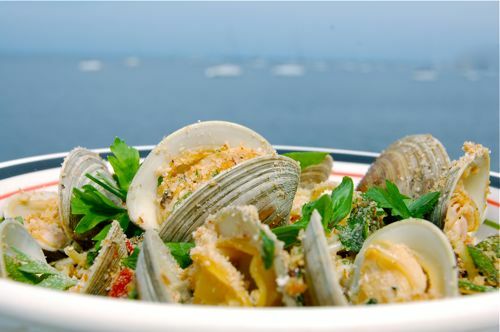 This along with memories of wet bathing suits, sand in the bottom of my two piece bathing suit along with great food, laughter and good company lead me to create my clam recipe that I share today with you. This is also know as clams in sand as the breadcrumbs in this dish resembles sand when thrown in around the clams , however you would like to refer to this dish it’s a wonderful dish that evokes the seaside. Rinse clams with water removing all sand. Fill sink with cool water, add clams and 2 tablespoons salt Let stand for at least a ½ hour. When ready to grill, rinse with cool water again. In the meantime in a large bowl, combine all ingredients except clams and mix well. Remove ½ of the mixture and set aside. Heat grill, place clams on grill until they open. Discard any unopened clams. Toss together with the breadcrumb mixture to serve. Cook spaghetti according to package instructions. Remove from heat and drain. Place spaghetti into a large mixing bowl with the remaining ingredients and mix well. Place onto a platter. Add the clams and bread crumb mixture on to of the platter of spaghetti and serve. Note: You can serve this as a clam appetizer by eliminating the pasta and serving the clams with just the bread crumbs. Serves 6. This entry was posted in main dish, Pasta, seafood and tagged clam recipes, family dinners, grilled foods, pasta recipes, seafood recipes, summer food, summer recipes on May 23, 2014 by entertainingbythebay. 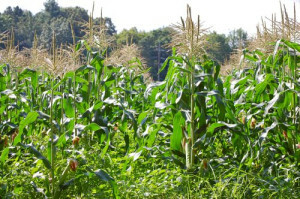 As the weather becomes cooler, I can’t help myself from buying various pumpkins, gourds, squashes and indian corn. It’s all part of the autumn ritual. I love the vibrant tones of autumn. I’ll haul myself over to the farm stand and start stocking up so that I can decorate indoors and out. I really can’t help myself and usually need a couple of trips back and forth before I think I have enough color around me. But even more important, is to buy some squashes to cook with . My favorite squash is butternut. I love the texture , color and subtle sweetness. Early in my cooking days, I was hesistant to cook butternut squash, because I found it hard to cut. I decided to cut it in half and just roast it with a little olive oil or butter. It saves alot of work and adds great flavor. 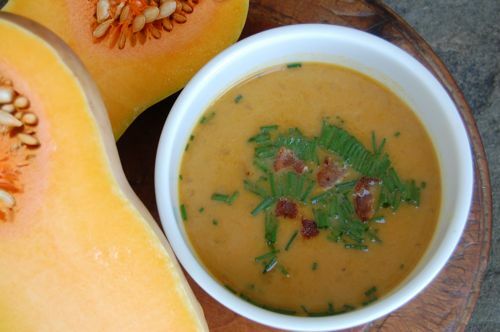 The first recipe is my favorite butternut squash soup. It’s easy to prepare and rich in taste. The second recipe is my autumn macaroni and cheese with roasted butternut squash. 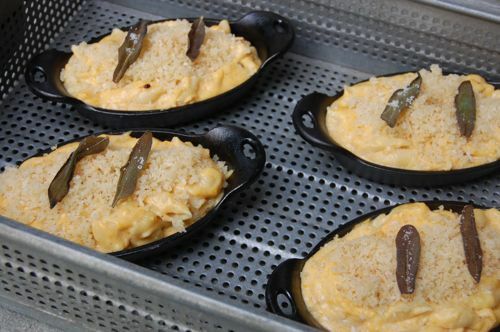 I like to serve my mac and cheese in small cast iron serving dishes. These smaller side dishes feel a little more grownup for a dish that appeals to the child in us all. I like to get playful with the ingredients of mac and cheese and one of many favorite versions is this butternut squash which is perfect for fall. From by the bay wishing you the squash filled food memories! In a skillet cook bacon until crispy. Put aside to cool. Once cool crumble bacon into bits, set aside for later to garnish. Preheat oven to 400 degrees F , on an aluminum lined baking sheet add the butternut squash dotted with 2 tablespoons butter, then season with salt and pepper. 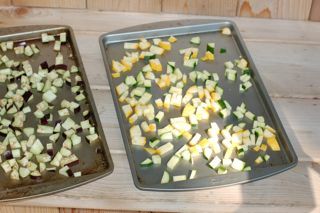 Roast in oven for 45-60 minutes until the squash is tender, depending on the size of the squash. Remove squash from oven and spoon out the pulp from skin. Set aside. In a large soup pot melt remaining 1 tablespoon butter, add onion and sauté until soft about 5 minutes. Stir in cinnamon and nutmeg and sauté for another minute. Slowly add the chicken broth, bay leaf and roasted butternut squash. Bring to a boil and then simmer for 30 minutes uncovered. Remove bay leave. Puree in food processor until very smooth. Stir in ½ cup crème fraiche. Serve soup warm. Garnish with crumbled bacon and chives. 1 small butternut squash, halved and seeded. Preheat oven to 400 degrees F , on an aluminum lined baking sheet add the butternut squash and the onions. Drizzle with the olive oil then season with salt and pepper. Roast in oven for 45-60 minutes until the squash is tender, depending on the size of the squash. Remove squash and onions from oven. Cool and then scoop the flesh of the squash along with the onions into a food processor to puree. Set aside. Fill a large sauce pan with water and bring to a boil to be used to cook pasta. On medium heat add to a small saute pan the remaining olive oil , when hot add the sage leaves and saute quickly on both sides until crisp. Remove from heat and drain on paper towel, sprinkle with salt and pepper and set aside. Place milk into a medium sauce pan and heat until it is about to boil. While the milk is heating, in another sauce pan, heat 3 tablespoons butter until melted. Add the flour and mix until smooth. Cook the mixture for about 1-2 minutes until it becomes a golden color. Slowly add the hot milk to the flour mixture whisking continuously. Bring to a boil and then cook for another 10 minutes continuing to whisk until the sauce begins to thicken. When the sauce is ready it should stick to the back of a wooden spoon. Remove from heat and whisk in the salt, pepper, cayenne and nutmeg. Add the shredded parmesan and fontina cheese to the sauce and stir until the cheese has melted. To the cheese sauce add 1 1/2 cups of the roasted butternut squash puree. Place sauce aside. Add pasta to the boiling water and cook al dente according to package directions and strain through colander. Rinse with cool water. Add the cooked pasta to the sauce and mix well. Divide pasta between 4 small 8 ounce cast iron serving dishes. In a sauté pan melt remaining butter and add the breadcrumbs and sauté 1-2 minutes. Remove from heat and top each dish of pasta with the bread crumbs. Place dishes onto a baking sheet. Bake in a preheated 350 degrees F oven for 25 minutes until the sauce starts to bubble. Remove from oven and serve with crispy sage leaves sprinkled on top. 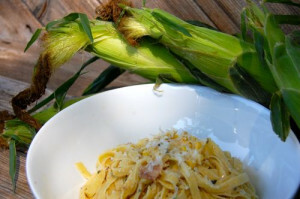 This entry was posted in Pasta, soups and tagged bacon recipes, butternut squash recipes, fall foods, fall recipes, mac and cheese recipes, macaroni recipes on May 23, 2014 by entertainingbythebay.